This was good news for a heron who otherwise would not have survived such a grave injury. We don’t know how the bird broke his leg, but the mid-shaft fracture would have taken some significant force. He was probably hit by a car. 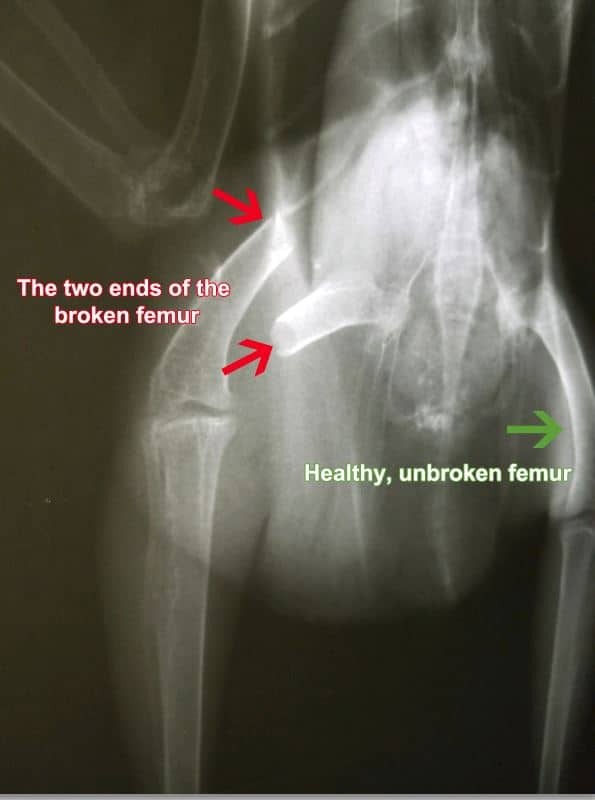 You can see the extremely broken and displaced femur in the photo of the x-ray taken when the bird was admitted to WildCare. Fortunately, despite the fracture, the bird’s feet and toes were still warm, indicating that there was blood flow down the limb. He clearly could also use his toes, which showed that the nerves were intact. WildCare Medical Staff gave the bird medications for pain and inflammation, and Dr. Sorem prepared for surgery. It was January 25, 2019. Orthopedic surgery on birds is not a common skill among for veterinarians. Birds are extremely sensitive to stress, and their pneumatic bones, air sacs and other anatomical differences from mammals make them challenging surgical patients. Fortunately, in the last several months, Dr. Sorem had been learning the intricacies of this procedure, and she felt confident that she could successfully pin the leg. 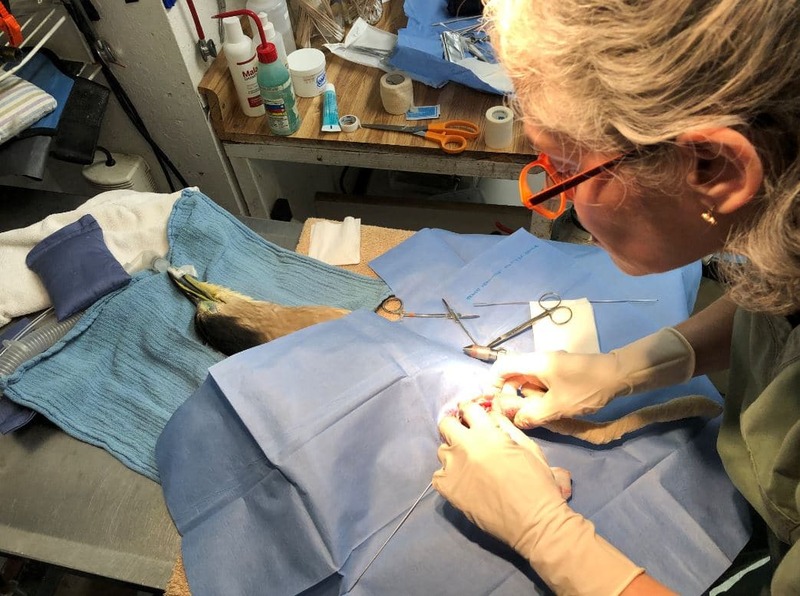 Dr. Sorem and her team successfully anesthetized the heron and began the orthopedic surgery to pin the bone. Significant soft tissue damage and displacement of the two ends of the bone made it a challenging case, but with careful work to align the broken ends and insertion of a metal pin, she was able to stabilize the fracture. As he came out of anesthesia, the bird received additional medications for pain and swelling, and the leg was splinted to allow it to heal. He was also placed on a course of antibiotics. 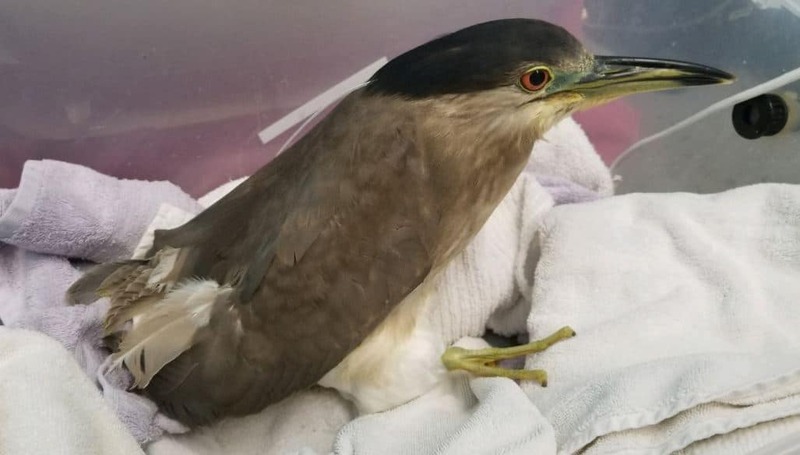 Over the next several days, Medical Staff monitored the heron for swelling and bruising at the surgery site, and for pain, and to make sure he was eating. His weight continued to drop, so the bird was tube-fed a nutritious slurry to give him the calories he’d need to heal. Over the next month it was an ongoing effort to entice the bird to eat on his own. Recovery from orthopedic surgery in humans requires extensive physical therapy, and this bird was no different. While the leg was healing, Medical Staff performed gentle physical therapy to stretch the muscles and regain the range of motion the bird would need to survive in the wild. Keeping the surgery site clean, checking the bird’s weight and medicating him meant daily checks on this heron, and as he healed, it became increasingly more difficult to catch him. This was great news, as being wily and difficult to capture is an important skill for a wild bird! After about two weeks, Medical Staff moved the heron to an outdoor enclosure where he would have additional space to move around and build muscle and flexibility in the injured leg. Dr. Sorem surgically removed the pin on February 13, and noted that the leg had healed well. The video below was taken on February 20, seven days after the pin removal. You can see that the heron walks, flies and perches successfully and he easily compensates for the healed leg. Two days later, the bird passed all the tests needed to confirm that he was ready for release, including the test to confirm that his feathers were appropriately waterproof. 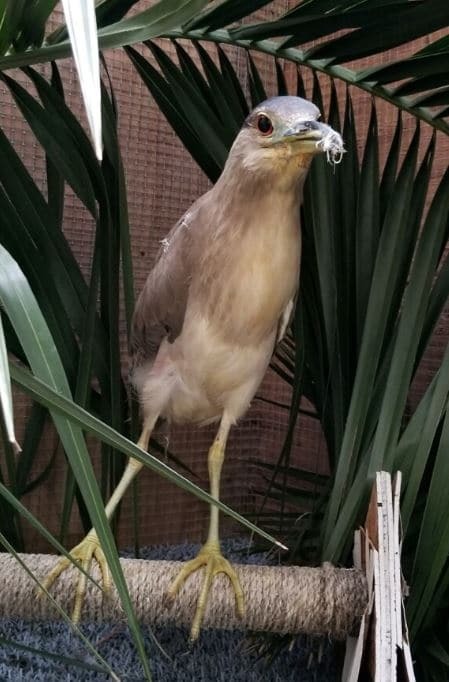 Dr. Sorem had worked so hard to make it possible to return this bird to the wild, so she was thrilled to take the night heron back to his home territory in a marshy area in San Rafael and let him fly free! Watch the release video below. How wonderful it is to know that this bird has a second chance at life in the wild thanks to the incredible medical skills of WildCare’s Wildlife Hospital! Amazing Medical Care for Wildlife Requires Resources! WildCare couldn’t heal animals like this night heron without the support of people like you! Are you ready to go above and beyond to help us help Wildlife? Click to become a First Responder with a regular monthly donation to WildCare and be on the front lines of emergency care for animals like this heron! Kudos to Dr. Sorem. Her love for these wild animals is unparalleled, and her skill in bringing them back to life is a joy to watch. I can only imagine how that bird must have felt when released back into the wild, healed and whole when he/she thought death was certain. Thank you! This is the truest form of love and compassion!